This newly discovered moth has been hiding in plain sight for a very long time. Its discovery has given biologists a useful clue about where to look for similar elusive new species. Dubbed Antaeotricha floridella, the moth isn’t hard to find—at least if you live in peninsular Florida—and it isn’t a non-native species. It stayed under the radar until now because it resembled an existing moth, and because it had a quirk when it comes to habitat. This quirk might be shared by a number of other species, for which biologists are now on the look-out. Until quite recently, A. floridella has been mistaken for Antaeotricha albulella, despite its solid white wings and strikingly different genitalia. This difference went unnoticed until a Mr. Terhune Dickel thought the moth seemed unfamiliar and brought it to Dr. James Hayden of Florida Department of Agriculture and Consumer Services. A dissection showed that this was indeed a new kind of moth. This discovery might lead us to more. A. floridella lives only in dry environments. While its well-known cousin, A. albulella flits everywhere, A. floridella has kept a low profile in dry scrub and sand hills. Scientists were well aware that dry and sandy environments support their own specific insects, just like they support specific types of other animals. But this is the first moth that’s been found to live exclusively in such environments. Where there’s one moth, there may be others. 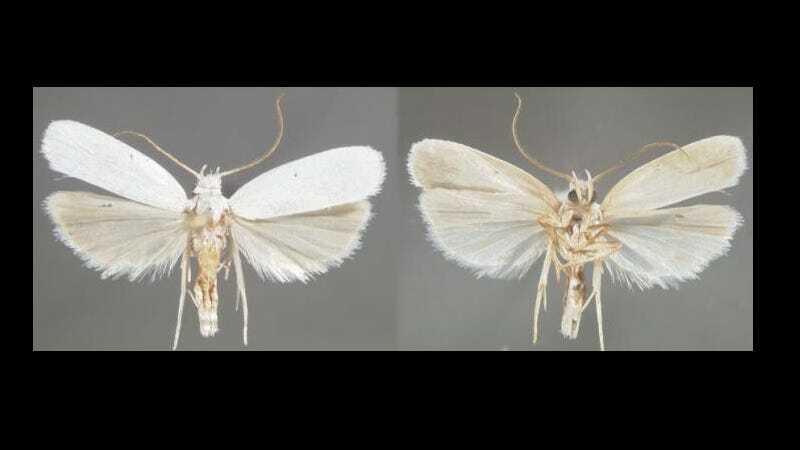 This might be the moth that leads scientists to find a whole new group of airborne animals that have hidden in plain sight by staying in their own kind of territory.